I’m coming up on the 2 year mark of what is known as the best idea ever known to mankind, …launching Germono Advertising Company. 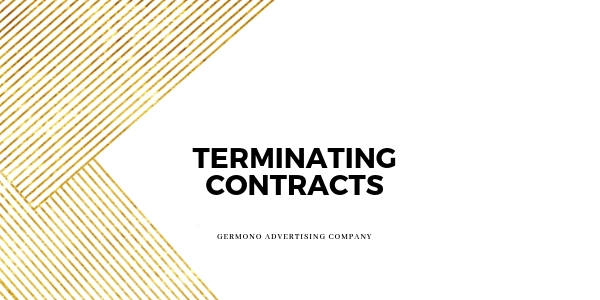 There have been so many experiences, and one that I discuss with other entrepreneurs quite often is that of terminating contracts with clients/customers. I wish someone would’ve had this conversation with me two years ago, so allow me to share it with you: It’s okay to turn-down or not continue business with a client. When working with clients, I become very close to them and their business because I want to help them. Maybe that is how you are? I immerse myself in their business plan and strive to increase revenue for them by way of advertising while removing some of the chaos that comes with planning media from the client. I have a lot of clients that appreciate me and see the value in what I offer…and that is when I truly shine. I’m not saying I need a thank you from each person, but I can tell when they love what I do. They text me after hours because I’m part of their family. They call me out of the blue to share exciting news about their business. But, I have come across clients that I felt aren’t 200% satisfied in what I do for them. It’s an intuition of sorts, as I can feel it very early on. So perhaps it’s time to part. Having a conversation about this comes from that gut-feeling combined with moral and ethical business acumen. As a business owner, you need to ask: am I making a difference for this person/company? Do they see that? If not, have the conversation with them immediately. It could be an easy fix. They could say, “Oh! No! We love you! Things have been so hectic around here, but we are totally happy with your services.” Or you could get the “I’m not sure” response…in which case, it’s time to have the talk. You aren’t doing yourself any favors by ignoring this gut feeling. We can make poor business choices when we are focused simply on revenue. You aren’t going to sleep soundly knowing you are offering a service that isn’t helping someone. Not every company is a good fit for others, and realizing that soon in your career will be freeing. It means you can walk away, shaking hands with that customer/client and sleep well. It means they’ll refer you to their friends and family and keep in touch with you along the way, something more valuable than ignoring the elephant in the room. So, what can you do to decrease the chances of this happening? Set clear expectations early-on, clarify roles and tasks, and establish contract performance goals. Germono Advertising Company launched December 2013 as a full-service advertising agency specializing in traditional media buying and placement in the Norfolk , VA market and focuses on helping local businesses succeed. Services include media planning, marketing and advertising consultations, and public speaking on advertising-related topics. Basically, we’re a bunch of gladiators. For more information, visit www.Germono.com, like the Germono Advertising Company Facebook page or call 757-777-3780 to learn more. You can also follow us via Instagram but that page is managed by company mascot, Athena so all you’ll see there are bullmastiff-selfies.